This past Saturday, my two loves merged: chocolate and running. 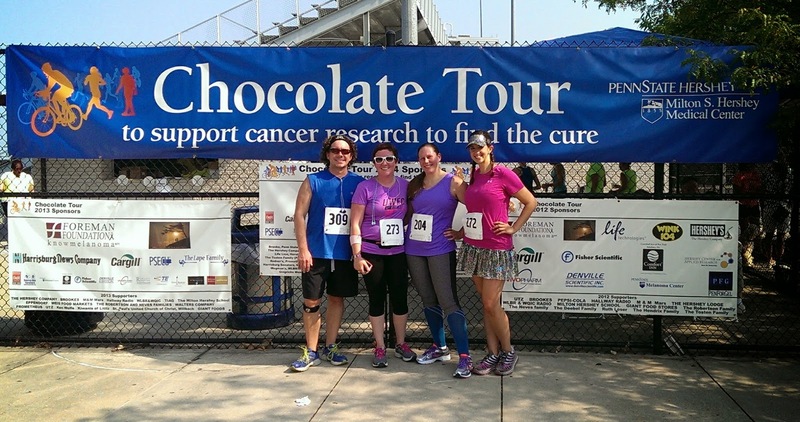 The Chocolate Tour 10k race was part of a multiple distance tour benefiting the Penn State Hershey Melanoma Center. You had the option of a 10k run, a 10k walk, and various biking distances. Since Hershey is about an hour from where we live, we got in the car super early for a weekend- 6:45 am. Along with Matthew and me, our friends Jen and Julie came along to complete their first 10k race! Exciting! Our race was scheduled to begin at 8:30 am. We arrived to the race site (the Milton Hershey School Sports Complex) around 7:55. There were no signs for parking so we drove around for a while looking for something that could be a race start. Eventually, we found a parking lot near the track/sports complex and were able to park. 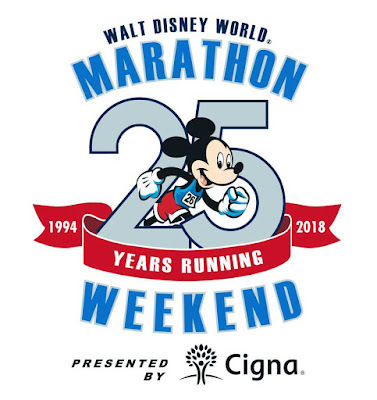 We were cutting it close on time- I like to be totally ready at least 30 minutes before a race- I think runDisney early starts are rubbing off on me! We were able to quickly get our packets (with Snickers bars included! ), t-shirts, and bibs. As we lined up, I noticed there weren't a ton of runners- this was definitely a biking event with a run added on. One weird thing- they had timing chips for our shoes that we were supposed to thread our laces through. I have speed laces so I couldn't get the laces through the holes. 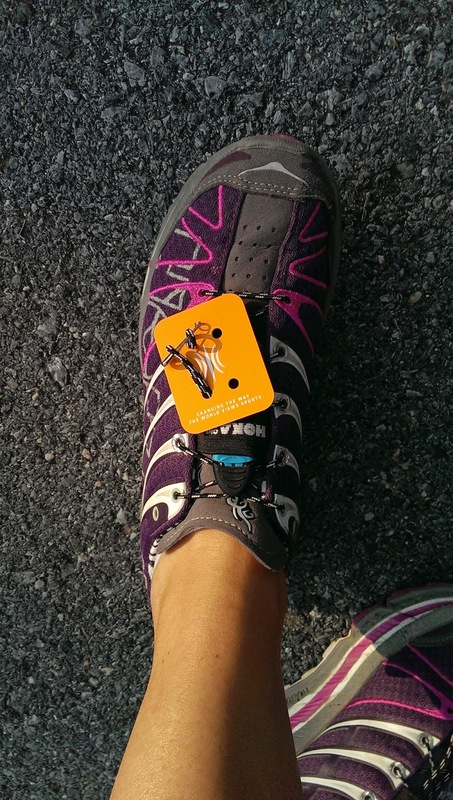 Luckily, I had an extra safety pin and was able to arrange it so it would stay on my shoe. Annoying, but no big deal. At the starting line we all agreed to run our own race but at the last minute I decided to stay with Julie. I'm pretty sure MacGyver would be impressed. Without much fanfare, we were off! The entire course was on the grounds of the Milton Hershey School property. This is a live-in school so it was almost like a mix between a college campus and a suburban neighborhood. It was a little hilly and with the sun beating down on us, it started to get warm. 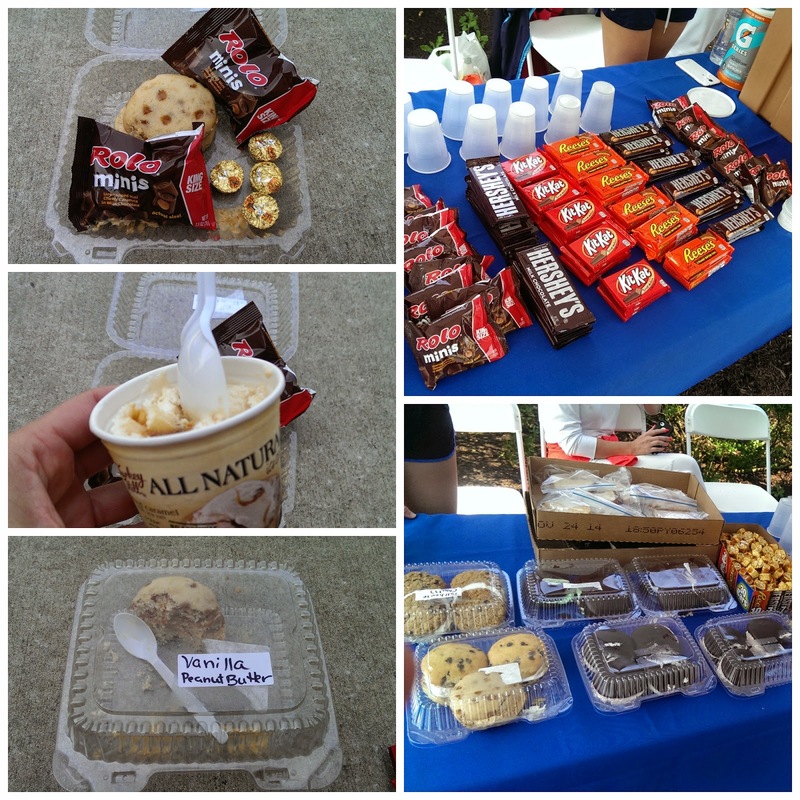 The coolest part about this course were the mile markers- at each one there was a different type of chocolate offered! I stopped for the Reese's Cups and the Hershey's Kisses- both are my personal favorite. However, my stomach didn't think this was such a cool idea so I stayed away from the rest of the chocolate offered on the course. In between the race and all the goodness we ate afterward, we actually squeezed in another two miles on the track at the sports complex. As you may remember, Jen and I are running the Divas Half Marathon in DC in less than a month so we wanted to get an 8 miler under our belts. 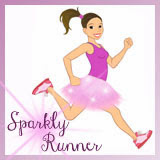 We have one more long run to go; a 10 miler next weekend and then we will be ready for her first half! At the race, there were a few local vendors giving out free stuff. It was mainly heathcare related and one table was giving out small samples of lotions and sunscreen. 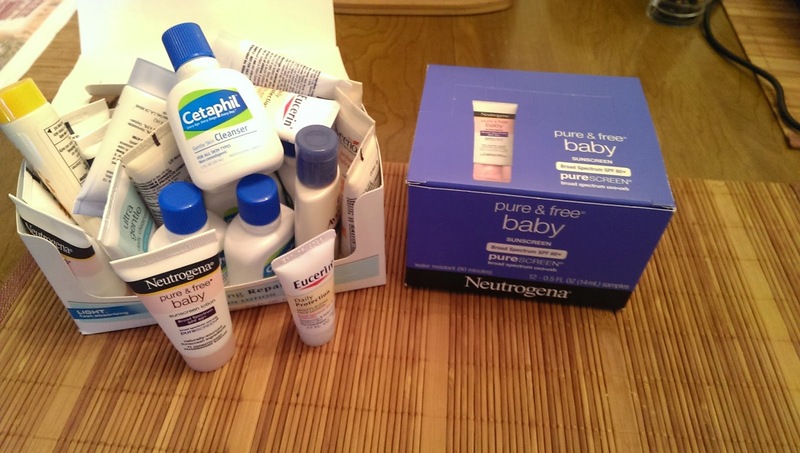 As we were picking up a few bottles, the dude at the table handed us each an entire BOX of sunscreen and then gave us empty boxes to fill up with whatever we wanted! These little guys are small enough that we'll be able to carry them on longer runs- so neat! No lie, we walked away with 40+ bottles of lotions and sunscreens. Overall, this was a great value for a local race. Yes, there will always be issues with signage, organization, parking, etc- every race has issues. 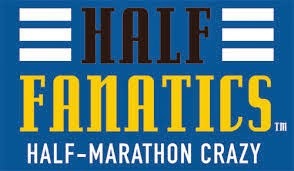 But this one had great volunteers, a novel concept, and lots of free stuff for the runners. I think we'd definitely do this one again. 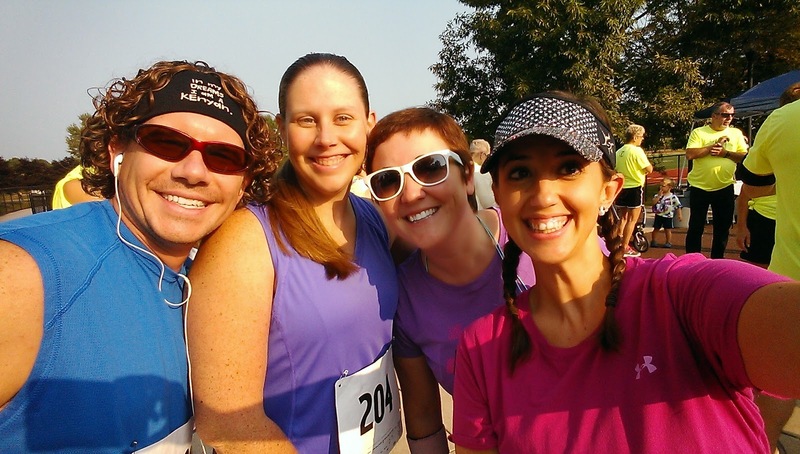 And, Jen and Julie totally rocked their first 10k! I am so proud of them and can't wait to see where their next race will take them. Yay for first-time 10k finishers! 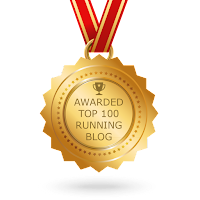 QOTD: If not chocolate, what food/drink would you love to see at each mile marker of a race? Please let me know if you do this one next year. Looks great! Wow! 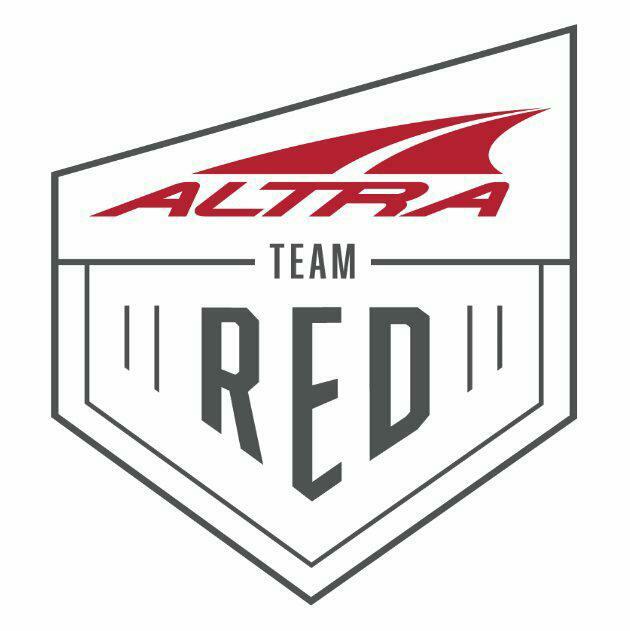 Once we move back up to PA I will have to check this race out! 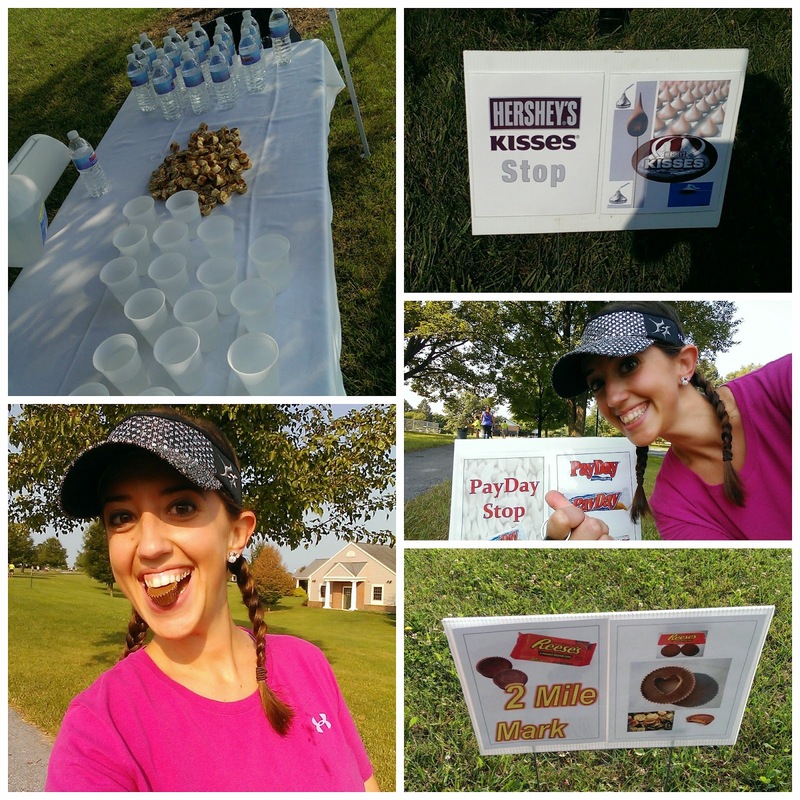 I love Hershey and I would LOVE to get all of those goodies while racing for a great cause. It really was a great race with so much free and fun stuff! Wow! Those are some great goodies! I'm not sure I could do chocolate at each mile if I was running. Maybe on a walk, but I'm not sure I'd tolerate very much while exerting myself. There are so many neat local runs out there. Thank you for posting about this!